Harte has made nine appearances for The Cherries this season. HIS BEST DAYS may be behind him, but Ian Harte is still going at the age of 37. 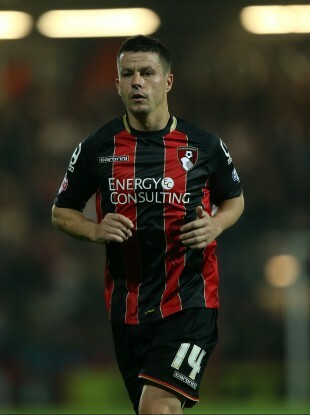 Until today, the former Ireland and Leeds United full-back had been on the books at Bournemouth. After joining from Reading in 2010, he made 26 appearances in his first season with The Cherries. This season, the World Cup 2002 veteran was limited to just nine starts (five of which were in cup competitions) but still played his part as Eddie Howe’s men did the unthinkable and earned promotion to the Premier League as Championship title winners. Although it may not come as a surprise then, we are saddened to learn that Hart and that sweet left peg of his will not be making what would surely be one last return to the top flight, as Bournemouth today released him and six other players. “It was a very difficult decision,” Howe told the Bournemouth Echo. “Ian has been a truly outstanding player for us in the two years we have had him. He has been magnificent off the pitch as well. “When we went up to the Championship, we felt we needed some experience and players who had been there and could help the younger guys in the squad. Ian fulfilled that role perfectly and also played a major part in our very good run towards the end of last season when he was excellent. “It is really unfortunate that you have to lose very good people along the way on the journey. We will be sad to lose Ian but also very thankful to him for his time with us. “I have always maintained that you don’t achieve success with just 11 players, you achieve it with your whole squad. Those players who aren’t necessarily playing week in, week out are just as important as the ones who are. They set the tone for the work ethic, team spirit and camaraderie of the squad and Ian has always been a positive guy with a very good outlook. What are the chances of a move back to local club Drogheda United then…? Email “Ian Harte and his sweet left peg won't be back in the Premier League with Bournemouth ”. Feedback on “Ian Harte and his sweet left peg won't be back in the Premier League with Bournemouth ”.